This image looks like something from the movie Twilight! Lisa and Ryan had their engagement session at Lisa's family residence. They had horse stalls, horses, barns, and acres of property. Lisa pointed out there was a really pretty spot in the woods that Neal may like for photos. She brings him to this opening in the woods with the fallen tree! Neal loved it! He asked if it was ok for them to come back to this location in a little while because the lighting would be better! They would just work in some other areas first. When Lisa and Ryan headed back to this spot, the sun was creating almost a spotlight. The trees in the back ground were glowing! 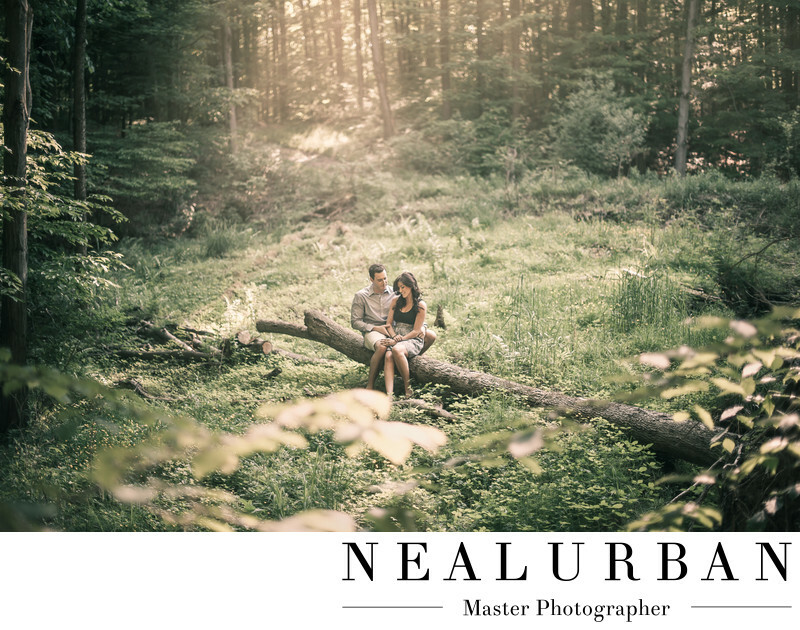 Neal had them sit on the fallen tree. Then he shot the image from much further back. He wanted to have the whole scene in the image! Lisa and Ryan were surrounded by some beautiful trees and greenery. It was so magical. It almost looked fake! Having photos taken at a location that is meaningful to the clients, makes them even better. We don't want to take them to a place that they can look back and say, why did we go there. We love when people have locations that nobody else can really go to. I do not think Lisa's parents would just let strangers come in and use the property for photos. This engagement session was the beginning of some amazing photos for Lisa and Ryan. They had their wedding ceremony at Our Lady of Victory Basilica in Lackawanna, NY. It's a massive church that looks like one you would see in Italy. Then for photos, we went to the cobblestone district in downtown Buffalo. The reception was at Salvatore's Italian Gardens. They had about four hundred guests! It was a giant wedding! Salvatore's is the venue to have for big weddings! Location: 6461 Transit Rd Depew, NY 14043 United States.